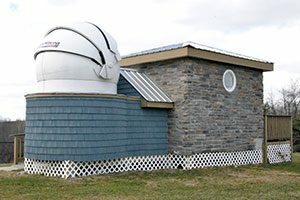 The Little Bear Observatory is a full-scale astronomical observatory located at Sanfordville Elementary School. The facility was built as a part of Warwick Valley High School’s Senior Project Program, which allows 12th grade students to earn high school credit while learning about, or working on, something that deeply interests them. The observatory founder, Caroline Moore, is a Warwick Valley High School Class of 2012 alum who made the project a priority from groundbreaking to ribbon cutting. The funds needed to build the observatory were raised by Caroline through monetary donations, as well as generous contributions of equipment, construction labor, materials and time. Since then, with the help of equipment at the observatory, one of the first supernovae was discovered in 2013, and high school students are using their interest in astronomy to create an Independent Study course in AP Physics, among other uses for the facility. The sudden (and temporary) brightening of a star, or the explosion of a star that has reached the end of its life, is known as a supernova. To learn more about supernovae, visit www.space.com.